In a no nightshades diet, you avoid vegetables and spices of the nightshade family in order to end chronic joint, muscle, and nerve pain. With a trial diet, you can find out if you can eliminate or reduce your chronic pain, even arthritis. It's thought that the nightshade family alkaloids – nicotine and its close relatives atropine, capsaicin, solanine, and tomatine – bioaccuumulate in the tissues and disrupt some people's metabolism. Dr. Sherry Rogers, MD, advises a three-month trial of the no nightshades diet for anyone who is in chronic pain, from any apparent cause—whether arthritis or pain at the site of an old injury. In her practice, she found that the majority of chronic pain patients become completely out of pain or improved. Her book, Pain Free in Six Weeks, includes a 31-page chapter about nightshades and how to do the diet. The rest of the book includes more diets and supplements to try. I discuss the book here. The diet was developed by Norman Childers, a Rutgers horticulturalist who researched the sometimes-fatal arthritis-like illness in cattle that graze on nightshade plants. He then made the connection to arthritis and pain in people. Click here for the List of Nightshade Foods for a full list of what fruits and vegetables to avoid. In a sensitive person, it's possible for a single french fry, one bite of hot pepper, or dash of seasoning to trigger joint pain or other pain. The only way for the no nightshades diet to be diagnostic—for you to find out definitely if nightshades are causing you pain—is to not ingest the smallest bit of nightshades during the trial diet. The most difficult part of this is that nightshade starch and spices are hidden in processed foods. Tobacco: It's likely that many people are in pain because they smoke. Don't smoke. If you have a debilitating pain condition, avoid second-hand smoke. Nightshade Vegetables (and a few unusual fruits): Potatoes, tomatoes, eggplants, green peppers, and chile peppers are served as vegetables. Potatoes are often eaten as french fries, "tater tots," hash browns, potato chips, potato salad. 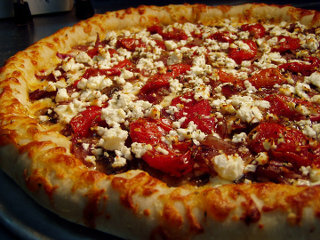 Tomatoes are eaten as ketchup, barbecue sauce, pizza sauce, spaghetti sauce. Hot peppers are used as flavorings in many foods and restaurant meals; in Mexican food and Thai food; hot sauces and barbecue sauces. The pimento in stuffed olives is a chili pepper. Nightshade fruits include goji berries and golden berries. Nightshade Spices include cayenne and paprika. Hot pepper spices are ingredients in chili powder and in curry. You'll find these spices in typical ethnic cuisines, including Mexican, Spanish, Caribbean, African, Indian, and East Asian. Processed Food and Prepared Food: Read the ingredients list on the label for any named nightshades or for the generic terms that typically include nightshades. Paprika and chile pepper are frequently used to add "zing" to processed foods, but are listed on the label only as "spices" or "flavors." Potato starch is a common filler in prescription and nonprescription medications and nutritional supplements. 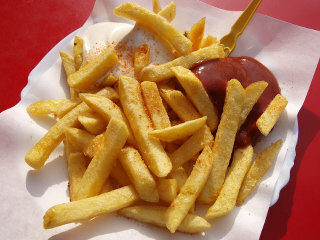 Unfortunately, the diet requires not only avoiding french fries and tomatoes, but most processed food. However, it sometimes takes only a few days of avoidance to have significant pain relief. Dr. Rogers recommends three months on the diet. It may take that long to get pain relief, as it did in her personal experience. Probably most people will respond within two weeks. In my own experience, I had some positive effect in about three days. I had maximum pain relief in two weeks. In my case, this was about a 25% reduction in overall pain. This was the difference between not being able to type at all and being able to occasionally type: a significant difference. However, I ultimately went on to a rare food elimination diet. I've chosen to continue the no nightshades diet based on my experience with experiments. After several years, I'm able to have occasional small amounts of nightshade family foods, about once a month, with no ill effects. If the diet relieves serious pain, it is typically enjoyable to continue! Of course you are always free to experiment. It is not necessarily a lifetime sentence. Click here for my difficulties and lessons learned in My Nightshade Free Diet Experience. You can make your own chili powder or curry by mixing the spices yourself and leaving out the nightshade spices. Caroline's story and nightshade-free recipes.